NKU students rush the state to celebrate with the men's basketball team. DETROIT — Prior to Tuesday’s Horizon League championship victory, NKU head coach John Brannen wondered how many people had turned out to support the Norse. “I was in the locker room; I came out with about three minutes to go before the game starts,” Brannen recalled. “I started to ask one of our staff members how the crowd was. Then I heard the announcer announce, ‘The fourth-seeded Northern Kentucky Norse versus Milwaukee,’ and after I heard our name I didn’t hear anything else (from the announcer). While there were plenty of supporters from Milwaukee, the Norse fans made Joe Louis Arena sound like BB&T Arena. The only thing missing was the gjallarhorn. Getting basketball fans in the region to take notice of the Norse is something Brannen has been talking about since his introductory press conference nearly two years ago. With every win this season, the support for the team grows and BB&T Arena becomes the homecourt advantage that Brannen and his team have hoped for. 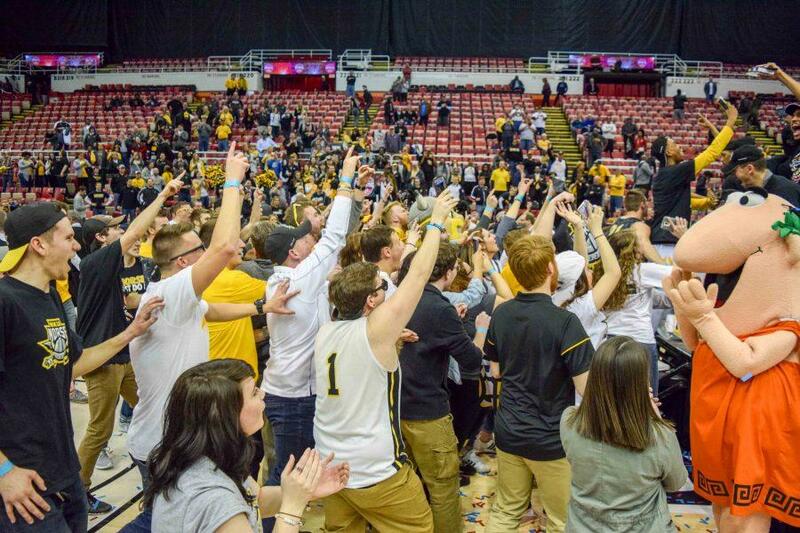 On Tuesday, Norse Nation brought that homecourt advantage to the home of the Detroit Red Wings. For McDonald, having the support of the crowd gave them the energy they needed. “To have the support of the community, to drive up here 4 1/2 hours to Detroit to back us, it really helped us in the game,” McDonald said. “On some of (Milwaukee’s) runs, we were able to cut it short with a big basket and the crowd would get us going. While the Norse will be playing in the NCAA Division I men’s basketball tournament for the first time, the program is no stranger to success in NCAA tournament play. In fact, NKU twice played for the Division II national championship. In 1996 and 1997, the Norse made it to the championship game before losing. In 1996, the Norse were defeated by Fort Hays State 70-63. In 1997, CSU Bakersfield edged the Norse 57-56. Northern Kentucky made 12 appearances in the NCAA Division II men’s basketball tournament. In a little more than a week, it will make its first appearance in the Division I tournament. While the men’s basketball team made history with the Horizon League tournament championship, it was not the first NKU team to accomplish the feat. The NKU women’s soccer team won the Horizon League tournament in the fall. They received the automatic bid to the NCAA women’s soccer tournament, where they lost to eventual national runner-up West Virginia 3-0. While almost every major sports network has their own bracketologist that crunches the numbers and projects a field of 68, official word on where and when the Norse play next will have to wait. CBS has the official NCAA tournament selection show at 5:30 p.m. Sunday. That will be shown on Local 12 in Cincinnati. Last year, someone leaked the completed brackets before the show began, meaning the long, drawn-out process of watching the 68 teams being unveiled was skipped by many. Unless we get so lucky again this weekend, we’ll have to watch and wait to hear the Norse’s name called. At least NKU will not have to hold its breath like so many teams on the tournament bubble. The Norse know they will be on the bracket. In the most recent change to the way teams are selected, the NCAA tries to keep the top-seeded teams close to home without playing on their home court. So while many of the bracket projections have NKU going to Indianapolis, that is by no means a guarantee. The last four at-large teams into the field, as well as the bottom-four seeded automatic qualifiers, will play in the “First Four” in Dayton March 14-15. If NKU avoids that fate, or if it wins in the First Four, it will be assigned to one of the following eight regional locations: Buffalo, Milwaukee, Orlando, Salt Lake City, Greensboro, Indianapolis, Tulsa or Sacramento.